Not that long ago, organizations had to rely on a number of established tools to build their business models, strategize, and innovate. The business plan use as we know it today started to decline in the 1980s and 1990s due to its complexity and time-consuming research process. This decline has – not surprisingly – been in step with the high-tech boom and Silicon Valley’s startup culture. A business plan was integral to any organization that wanted to be associated with innovation. But, what does it mean today? Despite – maybe due to? – their age and conventional status, business plans take time, effort, engagement of top consultancies, and financial resources to compile. Today startups, especially of the tech variety, cannot afford such luxury. To keep up with competitors, grow rapidly, and innovate, they require a truly agile technique, a mind map of sorts that’s easy to write, edit, and comprehend. Back in 2004, business theorist Alexander Osterwalder and his professor at the University of Lausanne Yves Pigneur suggested a business model design that could replace cumbersome business plans. An approach that was soon named the Business Model Canvas (BMC) has since acquired a respectable number of loyal practitioners. Not only have startups employed the approach, but also such giants as Microsoft, SAP, and General Electric. Let’s find out what the Business Model Canvas is and explore the ways a software company can leverage this method to drive success. Numerous adaptations of the methodology can be found. 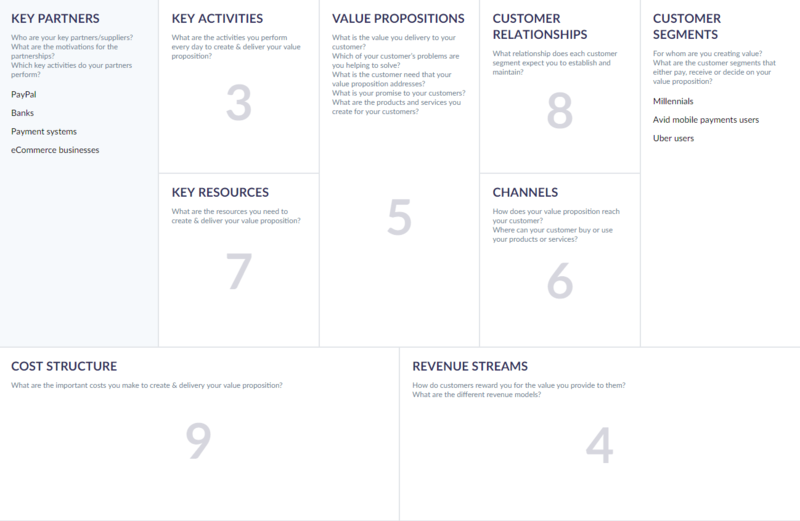 For instance, there’s a Lean Startup Canvas, designed specifically for startup launching. Even though it’s not approved by the BMC creators, many organizations find it useful. 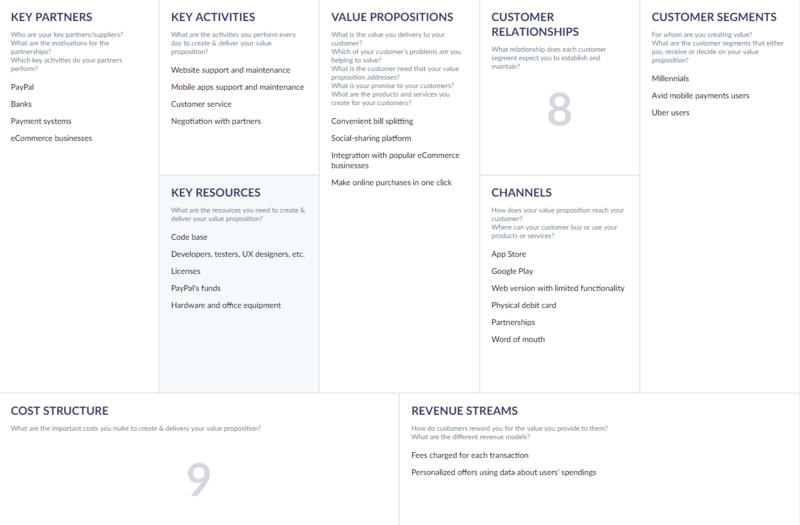 Tom Hulme’s Business Model Framework, in addition to nine building blocks, also covers growth and competitive strategy. One interpretation that Osterwalder and Pigneur consider acceptable is called Business Model Theatre. For you visual types, watch a 1.5-minute video right here. For the rest of you, here’s a quick recap: Just like in a theater, a business has a front stage and a backstage. Even though the audience can’t see what happens behind the curtains, it’s what makes the front stage work. Your revenue comes from the front, but only the backstage with its resources and actions can make the magic on the front stage happen. But today we’re going to focus on the original canvas since this tool has been tested by many more entrepreneurs and businesses and has been subjected to nearly ten years of research and development. 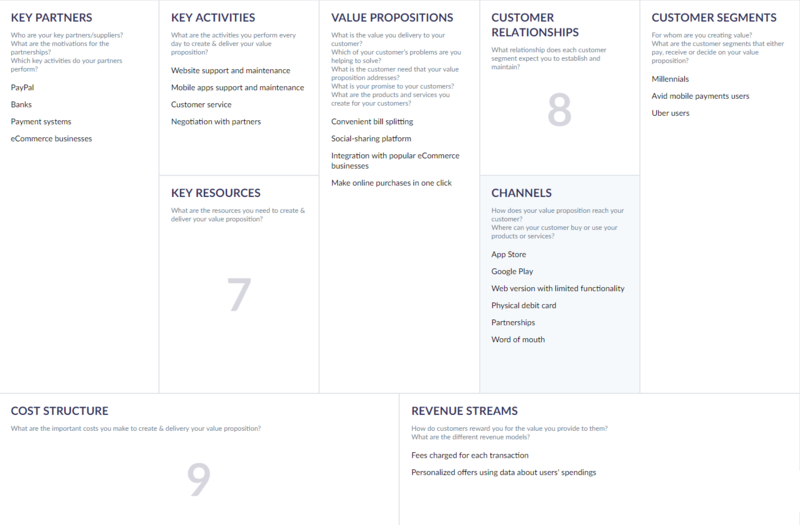 With the abundance of methodologies for building a business model, there must be something really special about the Business Model Canvas that has earned it a place among the classic tools. To start with a BMC, you will need: a small group of people, a board or a large sheet of paper, markers and sticky notes, and up to an hour of time. When you’ve gathered everything, it’s time to map out. Let’s get down in the weeds. Your customers are going to dictate how your business operates every day. By knowing and understanding your customers, you’ll be able to define the core of your business – the Value Proposition. If you are a software company, your customer segments can vary from private individuals to global organizations, and they all require different types of relationships, distribution channels, and payment options. 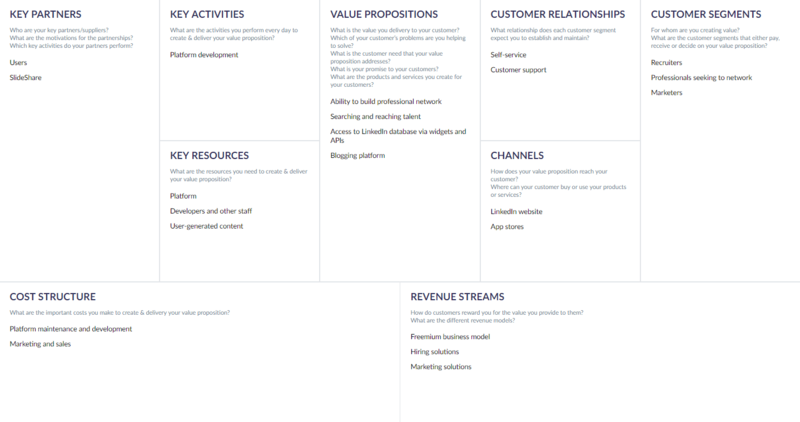 Previously, we explained how to create a Buyer Persona for a SaaS business. In terms of BMC, the concept is similar. With mobile traffic overtaking desktop traffic, it’s crucial to know the devices your customers most frequently use. That will let you know how clients with different devices experience your product and you’ll be able to tailor your content specifically to their needs. It’s no secret that half of freemium game revenue comes from 0.19 percent of mobile gamers. Despite the majority of users keeping up with their free plans, a freemium model still allows companies to drive revenue. Make sure you know the motivations of the people who are bringing you the biggest value but don’t overlook those who don’t spend a penny but watch your ads and contribute to the overall traffic. Users behave differently depending on how many times they’ve already used your product. Just like with the device type, you can customize personal experience depending on whether they explore your product via guest mode or log in. Let’s illustrate this and following sections using as an example Venmo – a PayPal-owned service for bill-sharing and easy payments between friends that recently introduced an integration with Uber. 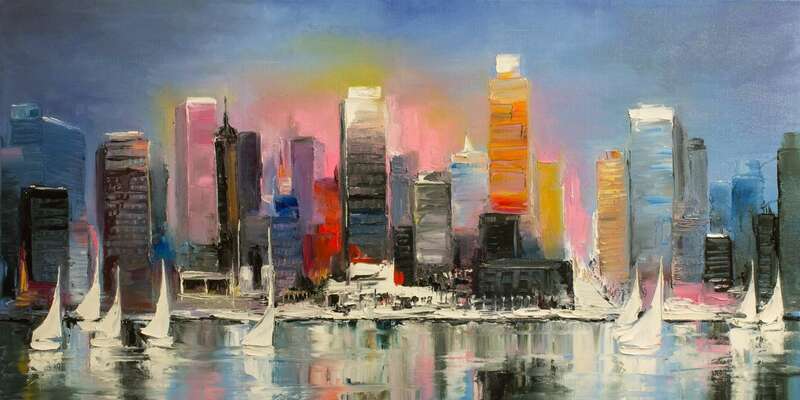 This canvas was created using the online template by CNVS. 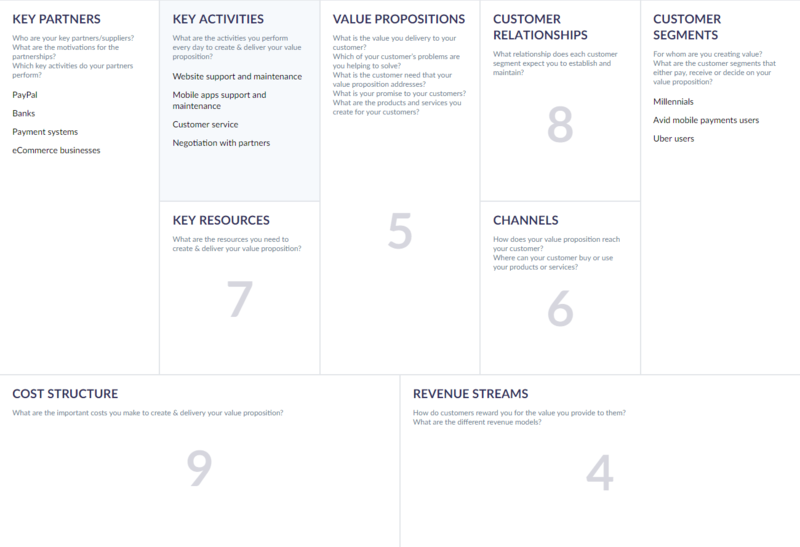 This building block defines your network of partners and suppliers that make your business model work. Bear in mind that not all your partners are your Key Partners. There are four categories of partners you can identify. Buyer-supplier is the most common type of business relationship that implies exchange of desired goods for both sides. It means a reliable source of supplies for you and a confirmed buyer of their products or your partners’. Strategy alliances between non-competitors. The idea behind this partnership is to leverage each other’s resources. As a startup, you can collaborate with many different suppliers until you decide which ones support your business model best. When it comes to a mature business, you have a lot to risk and therefore need reliable and long-term relationships. This is exactly the type of partnerships Venmo makes. The tool provides integration with many eCommerce stores allowing users to make purchases with their Venmo account on a featured website such as Urban Outfitters, Uber, or GrubHub. In return, these websites can use Venmo as an additional payment method. Joint-ventures are created when you need to fill the gap that only another business can fill, for instance, sell your product to a new niche. When you’re partnering with a company that has a missing element you require, it helps you grow your audience and increase sales. The affiliate plan we discussed earlier could be considered a joint-venture as well. Just like enhancing someone’s SaaS product with your API (or vice versa) or offering your customer upsells from a third-party. Coopetition is a partnership between competitors. It usually happens when both companies are struggling to launch a product and want to spread the risks to achieve common revenue. For example, when Apple launched an iPad, the tablet became the biggest competitor to Amazon’s Kindle. So, the rivals cooperated to sell Amazon books via the iOS Kindle app, which helped Amazon to extend its e-book market and established iPad as a viable reading device. Sometimes coopetition partnerships lead to mergers. PayPal, for instance, was born from the merger of two competing financial companies. Key Activities are what a company should do to make its business model work. For a pizza delivery service, it would be getting the freshest ingredients for the best price, preparing meals, organizing a call-center or a website, hiring couriers, etc. But in case you’ve developed an app that just gathers and transfers pizza requests, you have another set of actions such as supporting an app, organizing fast and seamless connections with partners, automatically updating menus, etc. Venmo, like most software providers, fall into the third category. Key activities for them are directly related to the platform. Consequently, the lion’s share of their budget is spent on supporting the system and scaling it up as the customer base grows. Depending on the product or service you are trying to sell, you need to have a clear understanding of the ways you’re going to drive revenue from each Customer Segment. A strategy that goes into identifying and managing your Revenue Streams is called a Revenue Model. Here are some of the revenue models that may work for you. See the article at the link for more information about monetizing your software business. Advertising. Such platforms as YouTube, Twitter, Google, and Facebook, along with many other free-to-download apps and services have grown mostly thanks to advertising. Yes, Internet users tend to block ads, but organizations find ways to keep advertisements, from simply asking for AdBlock to be disabled to curating highly relevant ads. Affiliate Marketing. This strategy is based on making commissions by referring other products and services to your audience. The key here is to select merchants in the same industry as you and recommend only the products you actually find beneficial to your users. Subscriptions. This model would be the best match for your SaaS, PaaS, or IaaS business. It also applies to on-demand streaming services, such as Netflix, Spotify, or any online publishers, such as HuffPost. Sponsorship. If you’re a small team of developers providing a useful, engaging, and preferably unique service, donations may be a way to go. Paint.NET is a free Photoshop analog that survives both by ads and donations. Include a PayPal donate button or kindly ask users to buy your team coffee or beer. Freemium. It’s a no-brainer why this model is so extensively used by a number of web services. By attracting an audience to the basic set of features, you provide the paying customers (another Customer Segment) premium features. Fee-based. This model requires a large pool of users who find the service valuable enough to pay a small fee. These fees can be either percent-based or flat and allow for easy income calculation. Venmo uses this model along with Uber, Stripe, and many online marketplaces. Its other powerhouse is data – by storing information about user financial activity, Venmo can make personalized suggestions and drive revenue from there. The Value Proposition is the reason for a customer to buy your product. A good Value Proposition is a unique combination of features that will either solve a customer’s problem or bring them additional value. The Value Proposition should be short. 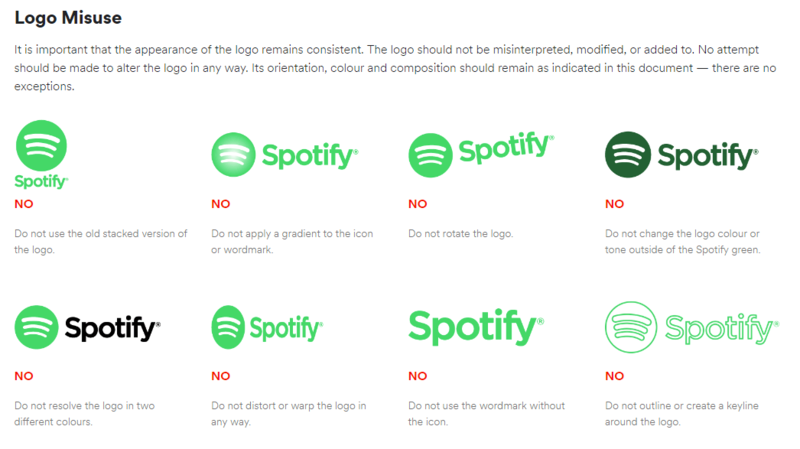 Make sure both you and your users can read it in less than 5 seconds and clearly understand what your product is all about. Drop vague descriptions and jargon. Please note: You should have different Value Propositions for each Customer Segment. Venmo has several value propositions focused on covering different customer needs. Its official tagline is short and simple: Share payments. The tool provides additional values with the social feed and eCommerce integrations, each of which will be important for different user groups. 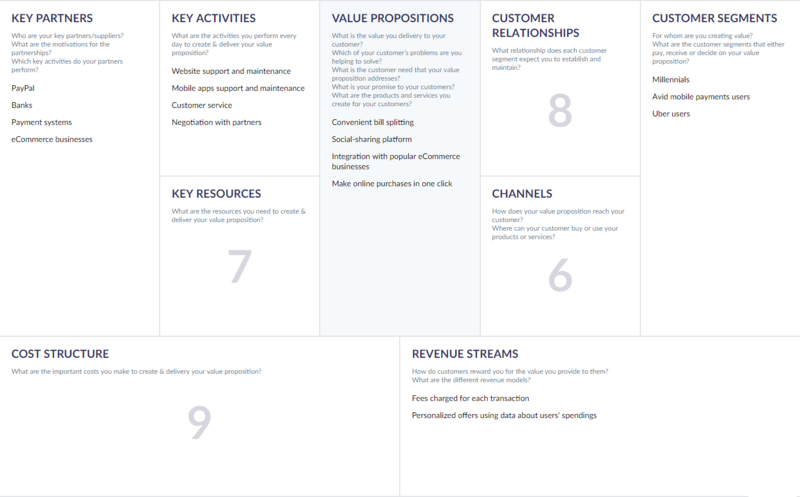 The Channels element reflects how a company aims at delivering Value Proposition to its Customer Segments. But that isn’t the only function of Channels; they can also create brand awareness and provide post-purchase customer support. 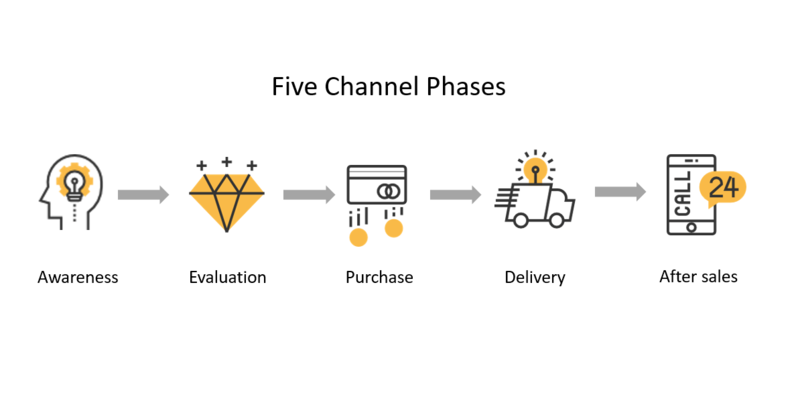 In the book Business Model Generation, Osterwalder and Pigneur highlight five phases of channels development. Each channel can cover more than one of these phases. Raising awareness. You can let your potential users know about your product through a wide range of channels. Currently, blogging and social media are the easiest ways to reach those who want to listen. Content marketing takes considerable effort, especially if you want to deliver quality content regularly, but it makes people engage and share content willingly. The awareness method that brings the most relevant and inclined-to-buy audience is word of mouth. However, it is also the hardest to scale. 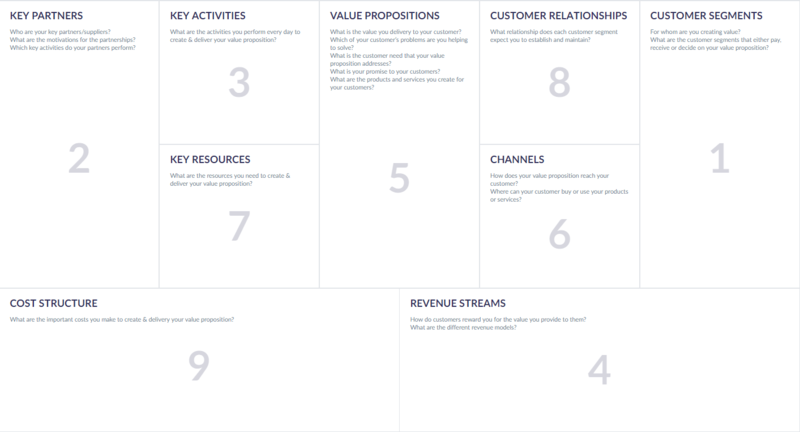 Evaluating your Value Proposition. How can customers find your proposition helpful? They need hands-on experience. The try-before-you-buy technique, for instance, does just that. Don’t forget to guide them through a product to make sure they received the desired value or realized its potentials. Case studies and reviews could be another way to help customers understand the value before taking their wallets out. Purchasing methods. Since we’re talking about software, your users will definitely be buying your product online. If you’re developing a mobile app, people should be able to find you in either the App Store or Play Market. If you distribute the app through another platform, make sure that users know that the payment process is safe and that they agree with the terms and conditions. Delivering the product. Although a software product doesn’t require logistics and a complicated delivery process, you still have to make sure that your app has been installed correctly and runs the way it’s supposed to. In our example, Venmo uses standard iOS and Android app markets to distribute, but it also has a website where users can view transactions without a payment option. Venmo also introduced a real debit card that users can obtain by applying online. As for its awareness-raising methods, Venmo relies on word of mouth and relationships with partners. Post-purchase support. This is the phase that customers care a lot about. What is the cancellation policy? How do they contact you with a problem or a question? What is the onboarding process? Nowadays, many software providers use chatbots or a simulation as one of their post-purchase channel. (You can read our article about designing chatbots to learn more.) Also, you can send out customer surveys, track reviews and questions on social media, or create personal recommendations based on user activity. Key resources play a direct role in creating your Value Proposition, delivering a service to your Customer Segments, and supporting Customer Relationships. Resources are typically categorized into four assets: physical, intellectual, human, and financial. Buildings, facilities, and vehicles, as well as any other tangible resource such as hardware or cooling system falls into the physical category. In the case of a software product, it also depends on what kind of delivery asset your product requires: whether you need to own hardware assets or they are sourced from a cloud provider. For a software business, core resources will likely be human and intellectual assets. Intangible (intellectual) resources include patents, copyrights, licenses, and customer knowledge. The on-premise or cloud services you may be using for your business is also a form of intellectual resource. As for human resources, all your software engineers, marketing specialists, and customer service representatives are valuable assets of any service-based business. However, it’s the costliest one as well. Consider outsourcing the services you can and remember to include accounting and legal consultants. There are several ways that startups can get their financial resource, including bank loans, advances from strategic customers, and venture capital investors. In case your business revolves around an important cause, you can request a grant or start a crowdfunding campaign online. Of course, the majority of startups nowadays are self-funded (although, these typically receive the least press mentions). This process is also referred to as bootstrapping a business. Though, it is likely the hardest way to start a venture as it takes time to save money, bootstrapping allows you to have full control over your venture. Venmo’s resources follow the standard model for software companies. Along with its own code base, a company acquires software licenses needed to build and maintain its services. Venmo also needs human resources such as programmers, QA experts, customer service specialists, management staff, and more. When evaluating your Key Resources, ignore those that would be common for any business, but pay attention to the ones that are strategically important to you. For Amazon Prime, Key Resources would be licensed rights to stream films and TV shows. For Microsoft, Adobe, or Google, it would be numerous patents. And insurance and banking organizations can’t survive without financial resources. Personal assistance. Make sure your customer can contact you at any time prior to or after the purchase and make the contact channels diverse and accessible: via e-mail, phone, or chatbot. A specific approach to customer relationship is dedicated client care workers. They can be involved to deal with SaaS customers. Self-service. This type of relationship is often maintained for the B2C client model. Except for automated updates and onboarding guidance, you don’t usually communicate with your users in this case. Venmo draws on a self-service model that provides users with an onboarding guide and a Help Center with FAQs. In some cases, users are free to directly contact support via phone, chat, or e-mail. Automated service. This is how Netflix and Spotify maintain relationships with their customers. By providing AI-powered recommendations of movies and playlists, the services imitate human interaction and keep customers engaged. Communities. To better understand customers’ struggles and facilitate connections between users, a company can create a community around a product or a brand where users can exchange knowledge. Have a look at Oracle. Their community with half a million active participants helps customers find advice among fellow users. Co-creation. User-generated content is a feature of the modern web. Anyone who’s uploaded a video to YouTube has contributed a service. The role of the company, in this case, is to precisely match content creators and content consumers. Another good example is HiNative that allows people around the world to contribute questions and answers about their languages on the same platform. Delivering Value, maintaining Customer Relationships, and buying Resources all incur costs. According to MarketRealist, only 10 to 20 percent of costs in the software industry go for research and development, only 5 percent of that sum is actually spent on innovation, and the rest goes to testing. Due to the large competition in the market, marketing expenses of software companies usually surpass R&D costs, which is why about 25 percent of revenue is spent on marketing and sales. Depending on the product, this number can vary. Support costs are related to handling customer requests and retaining your audience. Since it’s difficult to retain customers of a software product, a big chunk of expenses goes to Customer Success Management and churn prevention. Capital costs – investments that go into acquiring or upgrading physical resources, such as buildings and computers. Overhead costs – the general operational costs that have no direct impact on delivering a product, such as electricity, or a processing time for installation and testing software. Staff costs – resources spent on hiring, training, and retaining employees. As most tech companies, Venmo heavily relies on its R&D capabilities. Sales and marketing costs come in second, including customer support. Understanding how the approach works is one thing and following someone else’s example is entirely different. If you’re still struggling to figure out what should go on your board, here are a few examples to get your wheels turning in the right direction. Starting a lemonade stand is for many their first experience with running a business. 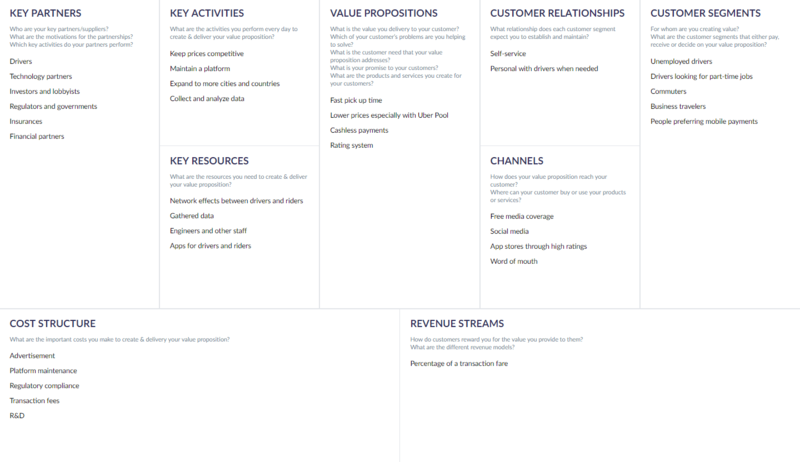 And it’s also – conveniently – a fine and simple illustration for a Business Model Canvas. Here, your partners, suppliers, resources, and even customers can all be your family and friends. As for revenue streams, it’s different from the software model and in most cases comes down to a finite price for a drink. Hotel alternative provider Airbnb concentrates on two big customer segments – guests and hosts – each of which can be broken down into subcategories. Same goes to value propositions: While some are attracted by cheap prices for greater value than hotels, others are searching for luxurious and unusual experiences that can be easily explored via the platform. Airbnb’s biggest source of revenue is its fees: Hosts are charged 3 percent and guests up to 20 percent. For a more detailed look at Airbnb’s model, check out this canvas created on Canvanizer. Uber is a common example used for understanding a BMC since it’s such a prominent business and a great case of innovation in technology. Just like Airbnb, another shared economy business, Uber has two big customer segments – drivers and riders. This segmentation is also geo-demographic as the service seems to employ drivers who live in areas with the highest unemployment rates. Uber is also an interesting scenario from a marketing standpoint – an innovative service, it enjoys a lot of free of media coverage. LinkedIn also offers multi-sided solutions for different customer segments – it’s widely used by recruiters to seek and contact talent, it helps people maintain a professional identity and connect with specialists in their field, and it can also be used by companies as a marketing channel. Despite keeping its main social function free, LinkedIn has three revenue streams for each customer segment. First is a paid account that widens one’s social reach, second is a hiring solution that helps recruiters manage job offerings, and third, ads that help brands target an audience based on their profile data. For more examples, make sure to visit BusinessModelGallery.com – a collection of thorough models and templates to inspire you or compare. The design of the canvas directly illustrates the way elements are connected and provides a clear understanding of the impact the building blocks have on each other. That’s why it’s important to follow the specific order to fill in your business model. While many business strategy enthusiasts compare the BMC to a traditional business plan, these two methods have fundamentally different approaches. Business plans are heavy 100+-page documents that take time to write, read, and edit. The BMC is meant to be a living document that’s always changing and evolving. Thus, you and your team can make immediate decisions and add changes on the go. If you have another look at the canvas, you will notice that one element – Value Propositions – is placed at the very center of the canvas. It’s a backbone, a bearing wall that separates the front stage and backstage of your business theater. Eventually, the BMC makes your crew members understand each other better. By using the same definitions for reference, you provide a transparent communication between people and teams. You can take your BMC sheet to a meeting, brainstorm, use sticky notes to outline your new ideas, and later place the canvas directly on the wall, making it easier for ideas to be seen and adjusted. By looking at the model and even after starting to work with it, many entrepreneurs argue that it excludes a lot of key factors for creating a thriving business. Executives are bothered by the lack of external factors. What about competitors? And why not include the organization’s mission and priorities? The short answer is: Because that’s not what the BMC is for. But let’s provide a broader explanation. The main purpose of the BMC is to visually represent how you intend to build or develop a successful business. It’s a simple scheme aimed at defining the pathway in the constantly changing market and providing a concise overview of how your operational processes link up with one another. Just as you can’t include profit as a resource, an external impact is more of an outcome than a building block of your business. Thus, instead of trying to fit those elements into the canvas, you can adjust the internal processes when complications arise. Imagination is the key. You can’t make the model work for you unless you want to work on it as well. It’s not a silver bullet and it’s not meant to apply to each individual situation. So, don’t make the approach restrictive. Stay creative and inventive when working with the canvas. Combine it with other tools, such as a Value Proposition Canvas from the creators of the BMC, or consider the ways other companies are successfully implementing this method. 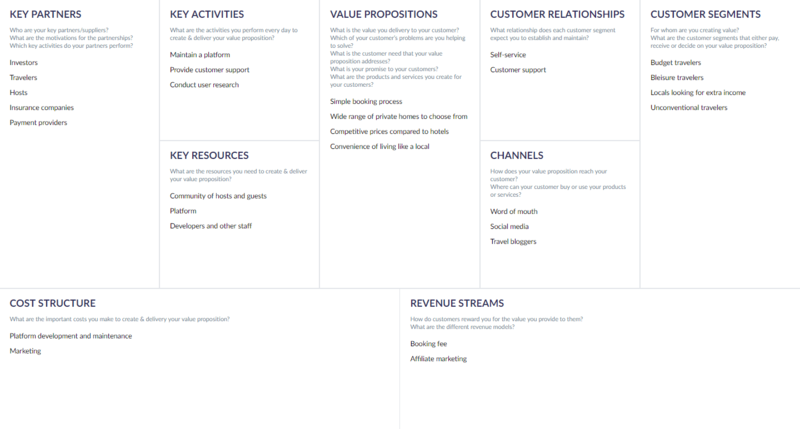 Here are just some of the reasons to use the Business Model Canvas for your established business. Detect opportunity gaps and find new perspectives. Create your competitors’ business models and compare them to yours. Keep track of external changes in each building block. Pitch investors using a visual representation that others can understand. Align your team’s goals and actions. Look at the business from a customer’s perspective. Analyze new opportunities, partners, and channels. Remember that you aren’t using the BMC to confirm what you already know about your organization, but rather to find flaws and pinpoint the ways to make your business processes more effective, and after evaluating the changes, act upon them. The BMC is not a tool that you use once or twice and forget about it till the next evaluation of your company. It was designed and invented to become a part of every business’ day-to-day life, a map to guide your ship between rocks and shallows. 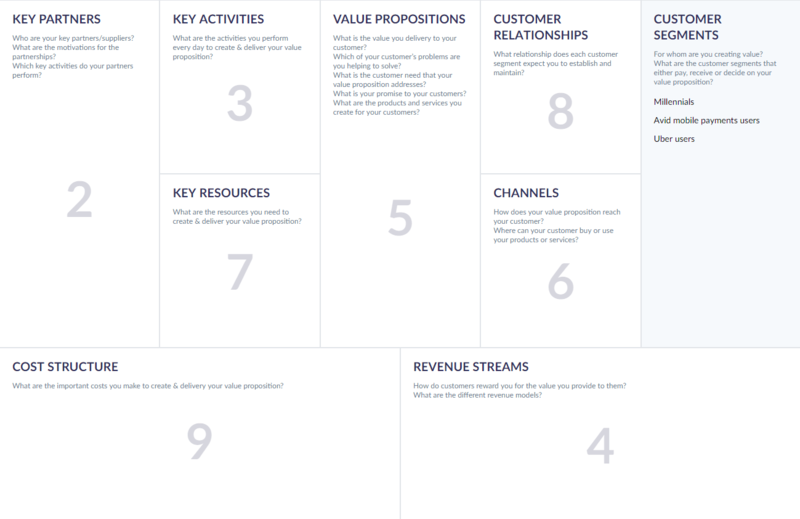 So, what happens after you’ve laid out your business model? Dashboard. Use the BMC to track the changes in your building blocks and the level of satisfaction of these changes. Color-code the most complex elements to focus on them more and attract the team’s attention to the current problems. Meetings. Use the BMC as a brainstorming instrument at meetings to unify new ideas and manage them later in your work. Understanding customers. You don’t have to create the BMC for companies only. 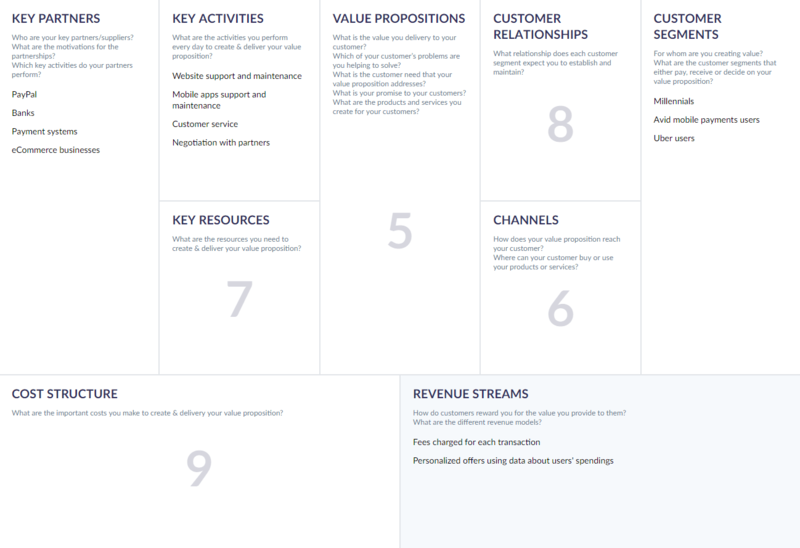 Try understanding your customer by creating their own business models. For instance, SAP, the German software giant, uses the BMC in their pre-sales process. The SAP sales teams sketch the customer’s business model to prepare for sales meetings. Onboarding. When hiring new talent, especially top management, you can use the BMC to give them an immediate understanding of where your company stands and help them join the team smoothly. Even though a traditional approach is to grab a large piece of paper (or a whiteboard), a Sharpie and start filling in the canvas, there are several options to digitize this process using the software. Let’s have a brief look at those options. Canvanizer. 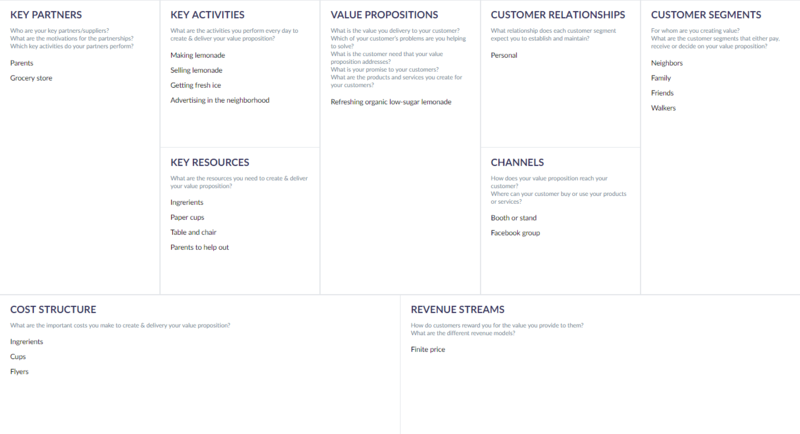 This is a free, easy-to-use business model canvas tool that allows you to share the same canvas with your teammates using links similar to Google Docs so you can brainstorm together. You can export the canvas into CSV or an image format. 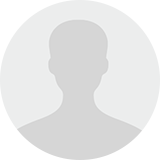 Besides traditional BMC, Canvanizer suggests templates for various similar and related tasks. 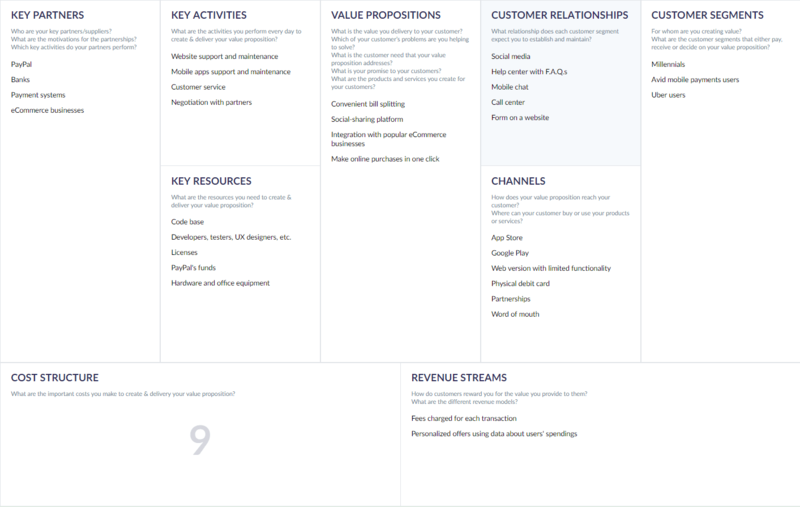 For instance, you can do SWOT Analysis, use Lean Canvas for startup planning, feedback canvas, customer journey canvas, and more. Strategyzer. The tool is much more complex than Canvanizer. 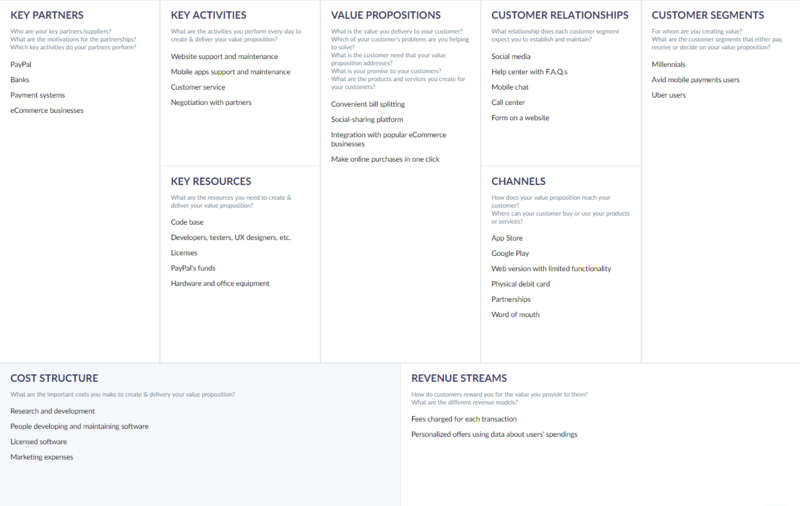 It allows for creating a Business Model Canvas and a Value Proposition Canvas with real-time collaboration support. Strategyzer comes with a built-in estimator module that can analyze revenue streams and assess whether the business idea is financially viable. Additionally, the product suggests a Testing Dashboard for Lean Startup development and has a number of other additional features that justify its price, ranging from built-in help to sticker color coding and advanced encryption. The base version costs $25 per month and supports unlimited canvases and an unlimited number of users. The enterprise package includes multi-team collaboration, portfolio management, and offers dedicated coaching. CNVS. We used CNVS to create visualizations for this article. The tool is great if you don’t need bells and whistles but you like clean and slick design with cute monsters. And it’s totally free if you don’t consider subscribing to their newsletter a payment. You can create traditional BMC, Feature Canvas, and Lean Canvas; share them with or with no editing access using a link; and that’s basically it. “The same products, services or technologies can fail or succeed depending on the business model you choose. Exploring the possibilities is critical to finding a successful business model. Settling on first ideas risks the possibility of missing potential that can only be discovered by prototyping and testing different alternatives,” said Alex Osterwalder, creator of the Business Model Canvas. No business plan works out the way you intend it to. The only way to be prepared and effective in the ever-changing market is to stay dynamic and ready to act. Instead of spending months or even years developing a strategy that may not even materialize in the end, you can adjust your processes on the go in the existing environment and surpass competitors while you’re still growing. Moreover, you will stay connected to your team with the power of co-creation and be sure that you’re on the same page with every party involved. Such a helpful blog, ty!